Almost exactly one year ago, Research In Motion introduced what I then called the Buick of BlackBerrys: the BlackBerry Bold. It was bulky, heavy and seemed made for the holster-wearing set. But what it lacked in style it made up for in comfort. It had a generously sized keyboard, bright screen and even a leatherette back to accent its luxurious side. The Bold was RIM’s first BlackBerry to run on the fast 3G network, and AT&T was asking $300 for it—$100 more than the least expensive Apple iPhone at the time. Much has changed in a year, most notably the growing number of serious competitors vying to steal customers from RIM (RIMM) and Apple (AAPL), and the surge of applications (“apps” for short) available for these super smart phones. RIM has long been proud of its diverse selection and the fact that it doesn’t force a “one size fits all” theory on its users. Instead, it offers BlackBerrys in all shapes and sizes, ranging from the Pearl Flip, a flip phone with a built-in BlackBerry, to the Storm 2, a touch-screen device without a physical keyboard, and several models in between. Now, the Bold has dropped its distinguished characteristics. The Buick of BlackBerrys has become as common as the Toyota Camry. Is there nothing left for the user who likes a large, luxurious BlackBerry? In a side-by-side comparison between this new Bold 9700, the Curve 8900 ($150 after a $100 mail-in rebate) and the Tour 9630 ($150 after Verizon’s $100 online discount), the physical differences are almost imperceptible. And these models don’t look all that different from the Curve 8520, which costs $50 with a two-year T-Mobile contract when bought at Wal-Mart (WMT). The new Bold’s smaller size means its keyboard also is slightly smaller than its predecessor: It measures about 5.5 centimeters across rather than 5.9 centimeters. I still found it relatively comfortable to use. But this keyboard is almost exactly the same as the keyboard on the BlackBerry Tour, except the new Bold’s bottom row of keys is slightly shorter. Unlike the keyboard found on the Curve 8900 and other less-expensive Curves, the keys on the Bold 9700 are positioned side by side with no spaces between them, and horizontal rows are divided by chrome frets. Look familiar? The BlackBerry Bold 9700 now resembles existing BlackBerrys. While the Bold 9700 looks rather undistinguished, it has a few less-obvious attributes that give it a little oomph. For starters, it uses a trackpad for scrolling the screen. Longtime Blackberry users will remember the original scroll wheel, which was on the right side of the device. In 2006, the scroll wheel was replaced with a trackball on the front of the device. This September, that trackball was replaced by a trackpad as first seen on the Curve 8520, and its appearance on this new Bold confirms RIM’s decision to use it as the navigational tool of choice. This trackpad is a tiny, touch-sensitive square that works by sensing a finger’s directional movements. Pressing in on the trackpad, like pressing in on the trackball, selects something on the screen. At first, I missed the satisfying physical feel of scrolling with the trackball, and the trackpad felt fast and less controllable to my thumb. But I soon got used to the trackpad and appreciated that it does away with all moving parts that could possibly get stuck—a trackball hazard for many BlackBerry users. The trackpad also establishes a flat layer beneath the screen that looks sleek and smooth in line with the four navigational buttons. Another advantage of the Bold 9700 is its battery life. If you take off this BlackBerry’s leatherette back, a battery that measures almost the size of the device itself lies beneath. This large battery supplies the Bold 9700 with enough juice to last up to 19 days in standby mode. By comparison, the BlackBerry Tour and Curve 8900 last for up to 14 days each in standby. The new Bold’s talk time is up to six hours, slightly better than the Curve 8900’s 5½ and an hour better than the Tour’s five-hour talk time. This thinner, lighter, smaller Bold is more comfortable to use for phone calls than the original, which could make users feel like they were holding a small piece of toast up to their ear during calls. I made several calls with no problems. Emailing on this Bold 9700 was as simple as always, and I set up four email accounts for testing. Despite its fancy new BlackBerrys, RIM needs to overhaul the way it handles apps. 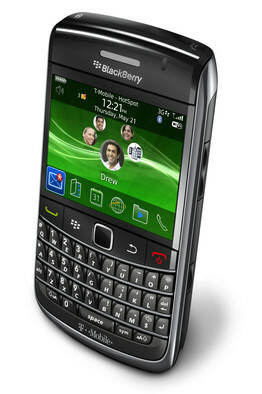 The Bold 9700 comes preloaded with a prominently positioned icon for RIM’s BlackBerry App World store. But apps downloaded from here still go right into the “Downloads” folder, sending users unfamiliar with this system into a frantic search for their newly downloaded app. And not all apps go into that folder; the Facebook app goes straight to the “Apps” folder. Why not put every new app right on the home screen and let me put them into folders if I so choose? Once apps are downloaded, RIM neglects to notify you when all apps need to be updated. On my personal Curve 8900, I recently dug into the settings of my TwitterBerry and Facebook apps and manually checked to see if updated versions were available for each. This was the case, and I downloaded the new versions, but most people would never think to check for this kind of thing. Instead, RIM should send notifications about available updates for all apps. The other attributes of the Bold 9700 are like the BlackBerry Curve 8900 and Tour: They all have cameras with flashes that are capable of capturing 3.2-megapixel photographs, bright 480×360-pixel displays, built-in GPS and slots for microSD memory cards so as to expand their memory. If you’re considering a BlackBerry upgrade, the Bold 9700 offers 3G and Wi-Fi, a combination not offered by another BlackBerry with a full physical keyboard—other than the original Bold. But since many of the Bold 9700’s features are about the same as less-expensive BlackBerrys, it’s worth considering the Tour and Curve 8900 before you spend $200 on a device that no longer lives up to its bold name.